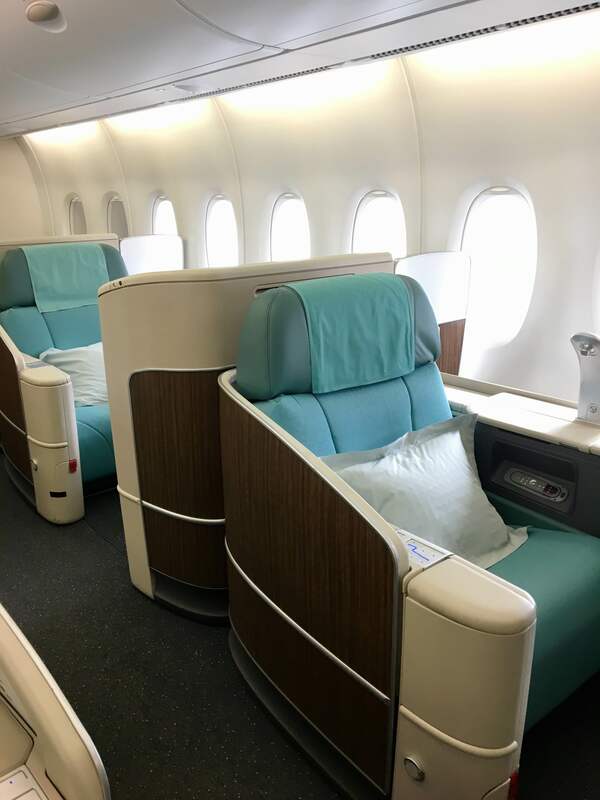 Korean Air First Class has some of the least full First Class cabins out there, meaning you are more likely than not to be sharing this comfortable and private cabin with a minimal number of fellow passengers. 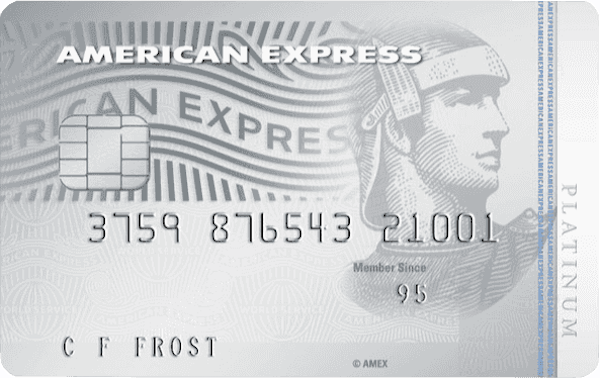 This is a great choice for those who can earn Starpoints, such as having an Amex card, or purchase them from Starwood Preferred Guest and have enough time to endure a longer transit time by going through Seoul (compared to Singapore or Hong Kong, for example). 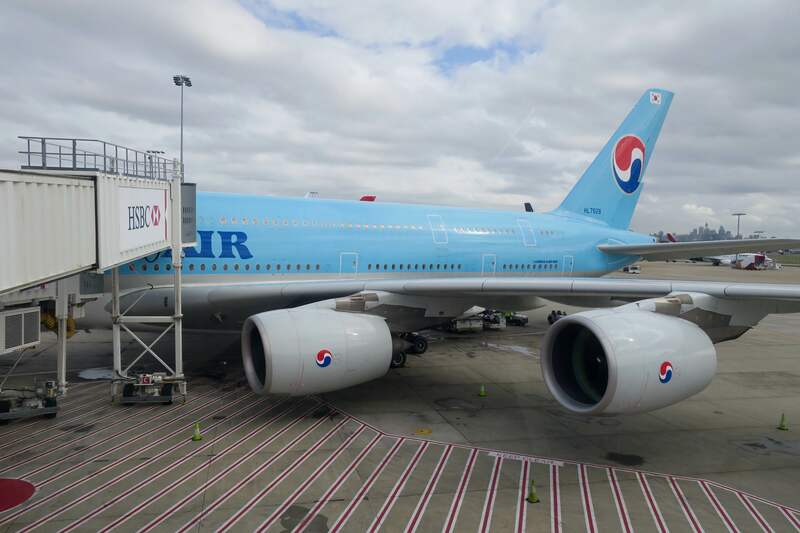 The Sydney to Seoul leg was on an Airbus A380, which was temporarily put on the route; normally, it’s an older Airbus A330 flying the daily morning service departing Sydney at 9am and arriving in Seoul at 5:30pm. 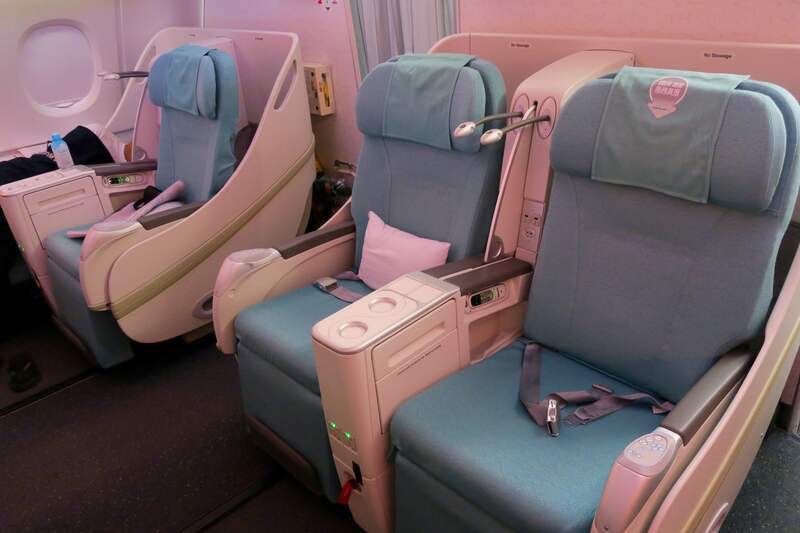 An A330 flies the Brisbane to Seoul route, with a 2-2-2 configuration in First Class. The Seoul to San Francisco leg was on a new Boeing 747-8i aircraft (this aircraft will temporarily be serving Sydney in September-October 2017.) 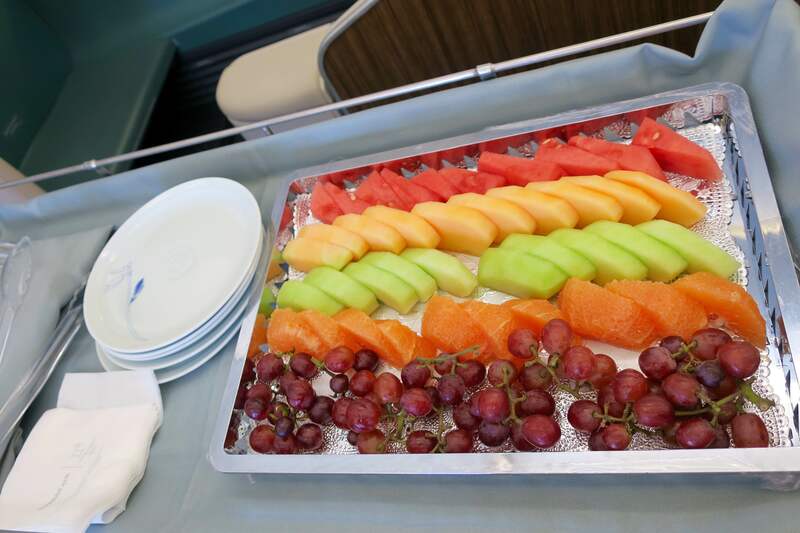 This service departs Seoul at 4pm and arrives in San Francisco at 9am. This aircraft is currently serving the Auckland to Seoul route. 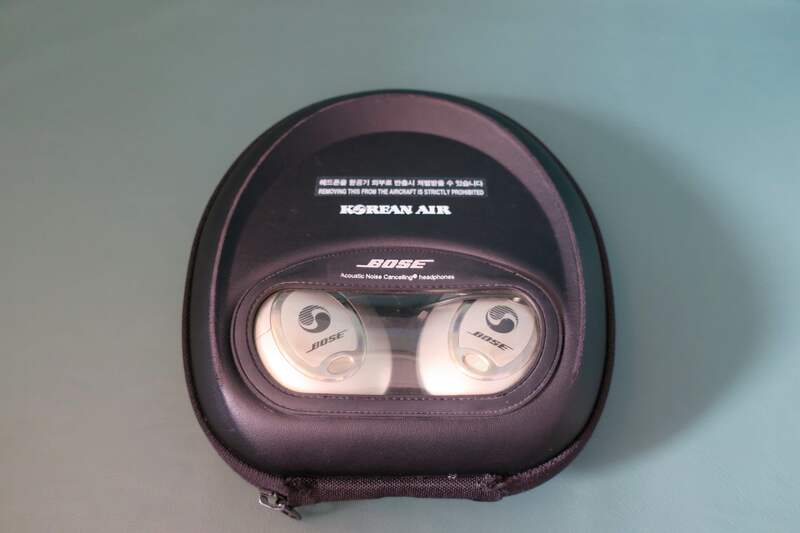 I would rank the products on these aircraft from best to worst as: Boeing 747-8i, Airbus A380, Airbus A330. 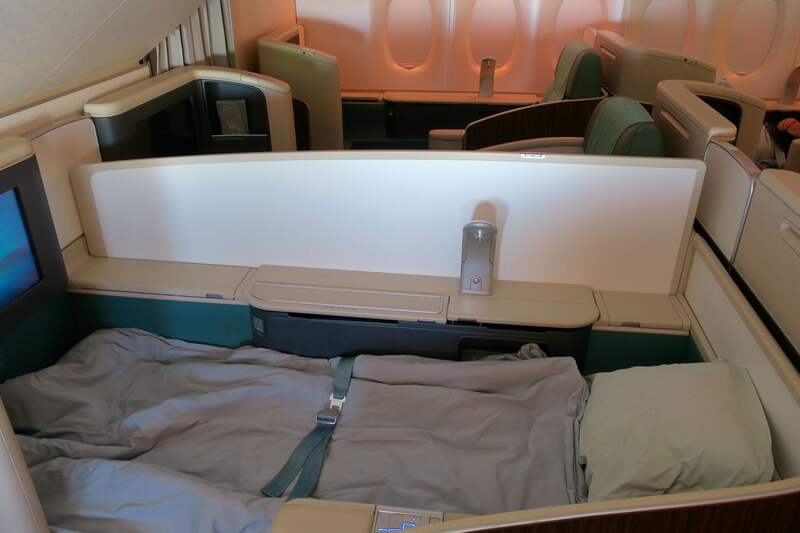 First Class on the Airbus A380 features the older version of Kosmo Suites. There seems to be a wasted opportunity to position the seat and passenger closer to the window, with an upward ventilation duct situated there. 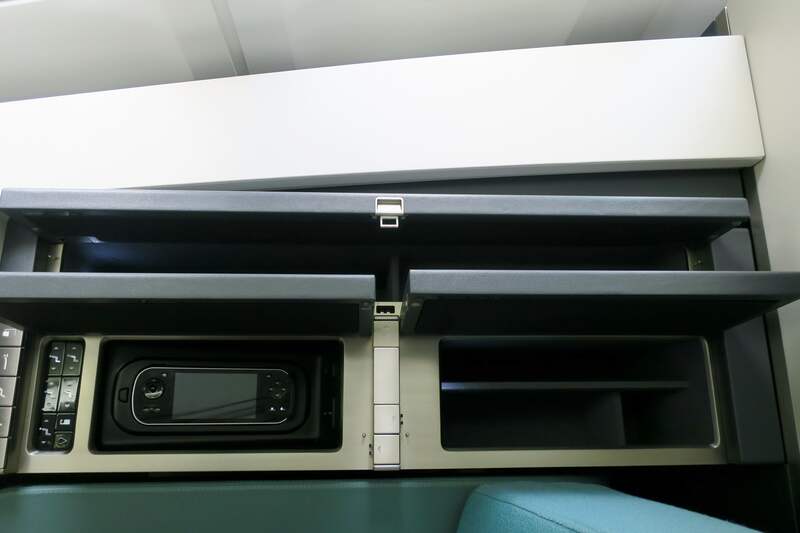 This cabin features 12 open suites (no sliding door, but a partial vertical screen) in a 1-2-1 configuration on the lower deck. It is very strange that there was only one bathroom for the whole cabin. 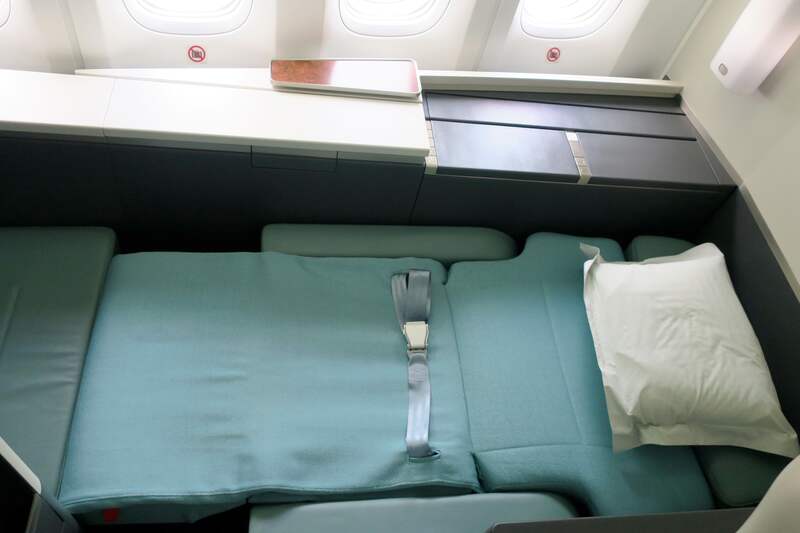 As Korean Air First Class generally has low load factors, given 9 of the 12 seats were free, I asked the cabin crew to make up a centre seat as my bed. 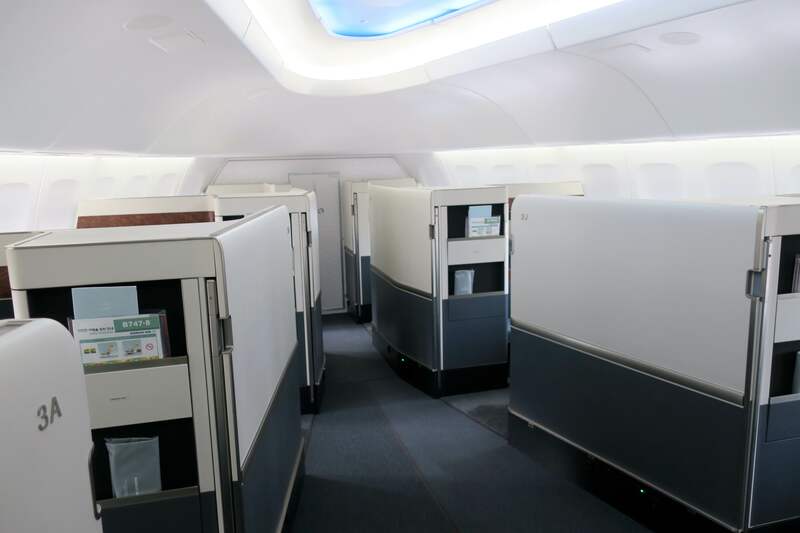 The Business (Prestige) Class cabin takes up the full upper deck, arranged in a 2-2-2 configuration. 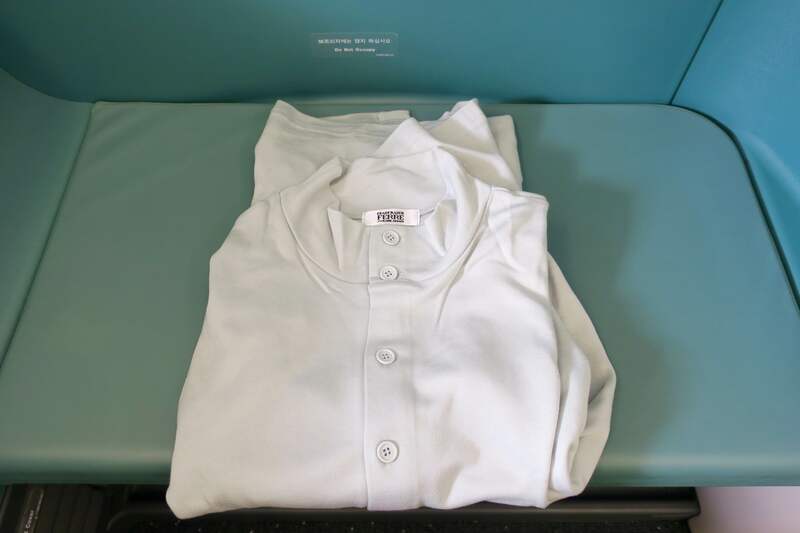 My recommendation of seats in First Class would be the window seats in row 2 for solo travellers and the centre seats for couples, thus avoiding being too close to the lavatory in front and galley in back. 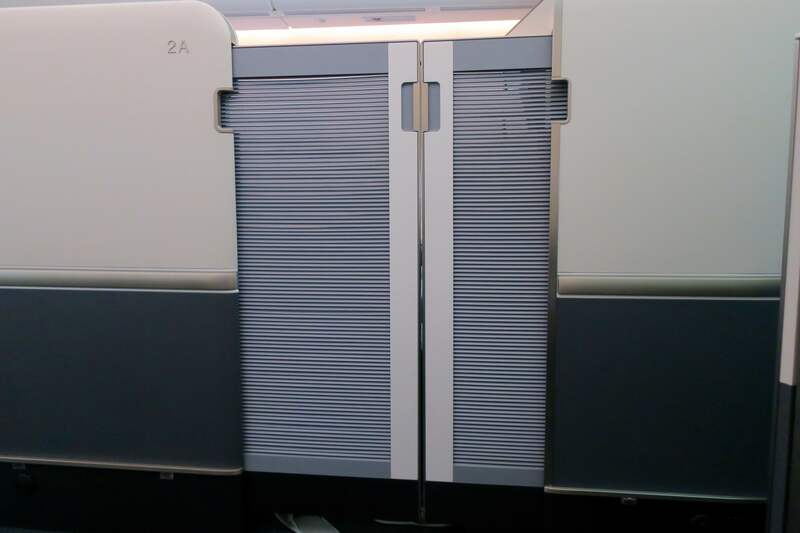 The Boeing 747-8i features six First Class seats with the newer Kosmo Suites 2.0. They are arranged in a 1-1 configuration at the nose end of the 747 on the lower deck. There are a generous two bathrooms for six First Class passengers. The bed was so comfortable that I was almost annoyed I slept six hours straight. 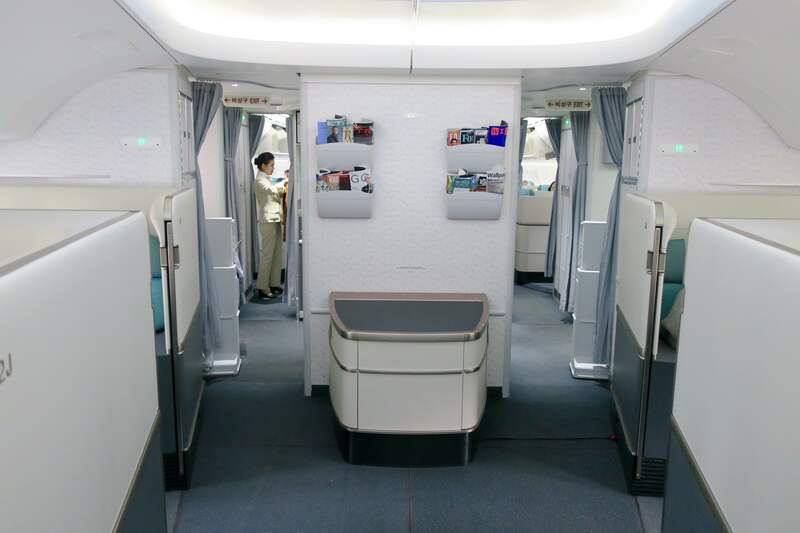 The main difference, though, is that the seats on the 747 are closed suites, meaning they have a sliding privacy door which has slats designed for outward viewing only, i.e. other passengers or cabin crew can’t see in unless they pop their head over. 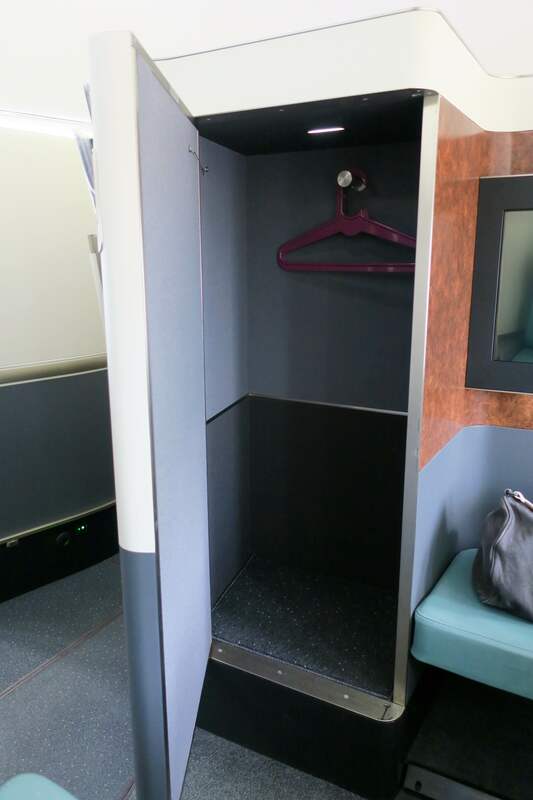 …and these three smaller compartments hold toiletries, reading material and gadgets. Business (Prestige) Class on this aircraft is split into the main cabin directly behind First Class and a mini cabin upstairs. It is configured in a 2-2-2 layout, but each window seat has direct aisle access via a closed-off walkway. My best recommendation would again be row 2 to get away from the galley, but also to not be too close to the front. If you wanted maximum privacy with no one else in front of you, then I’d go with row 1. In Business Class, the mini cabin upstairs is usually quieter with less foot traffic. 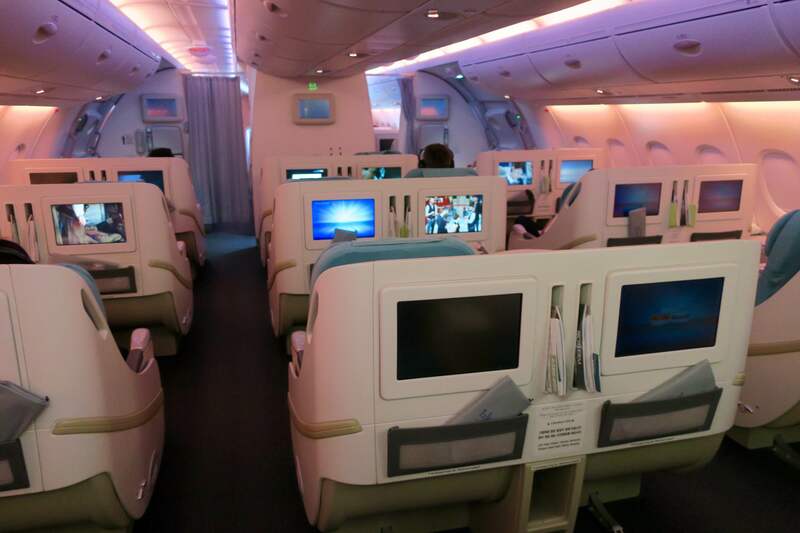 In terms of the actual seat, it seemed to be exactly the same on the A380 and 747. I, at 5’10”, sat cross-legged and my knees just touched the sides of the seat, i.e. it was pretty damn wide, as well as long. 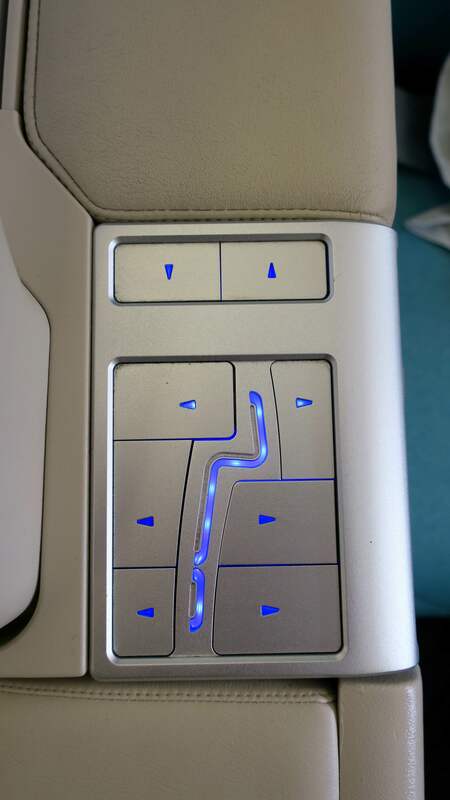 There are almost too many seat control options, but once you realise there are three presets (takeoff, meal and lie-flat), life becomes more simple. There are two USB ports and a universal power outlet (Australia/NZ, US, Europe and UK) at each seat. There is no wifi on either plane. There was minimal noise on either flight. 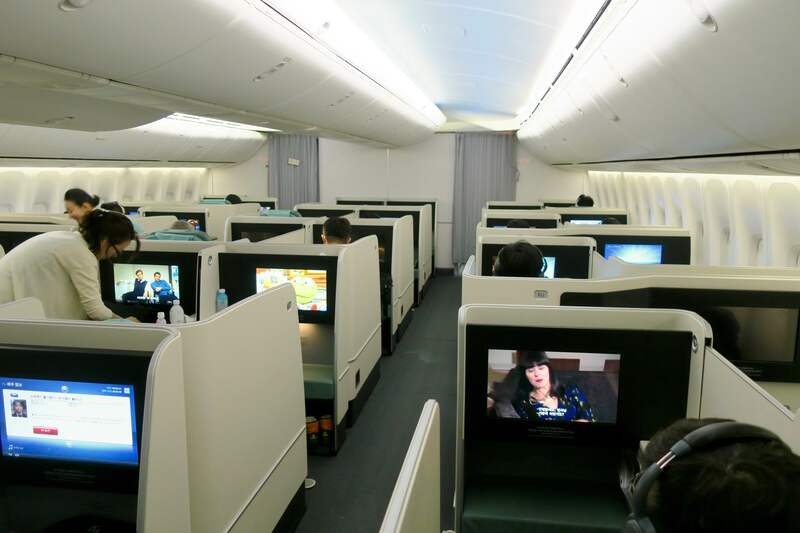 And as with many Asian carriers, the cabin is kept quite warm. The pyjamas are comfortable, but may run a tad small for Westerners. The amenities kit by Napa Valley’s Davi had most of the usual trimmings, including a cool eye gel, but strangely lacks earplugs and socks. 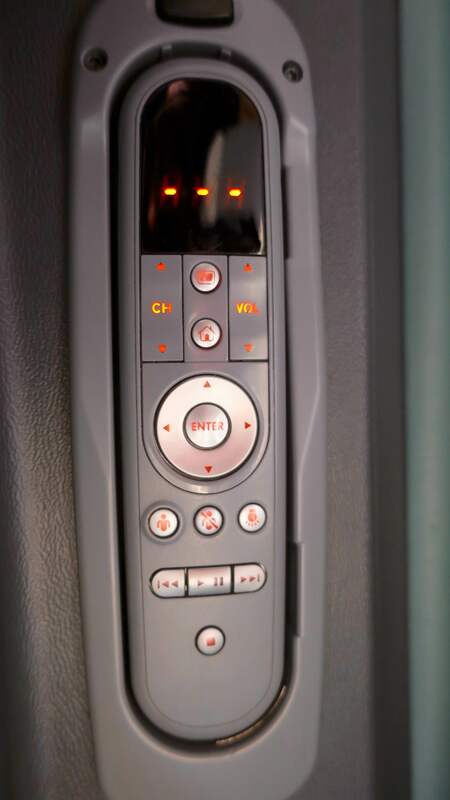 The pros of the IFE was that it had no annoying ads, a relatively easy navigation system, and an adequate selection of movies, both new releases and classics. The cons were a very limited selection of TV shows and music, and that the remote on the A380 seemed to be straight out of Economy Class. Let’s start with the on-ground experience, which was pretty average in both Sydney and Seoul. The First Class check-in counter at Sydney was not even manned. Granted, I was asked to pass over to the Business Class counter, where there was nothing remarkable about the process. 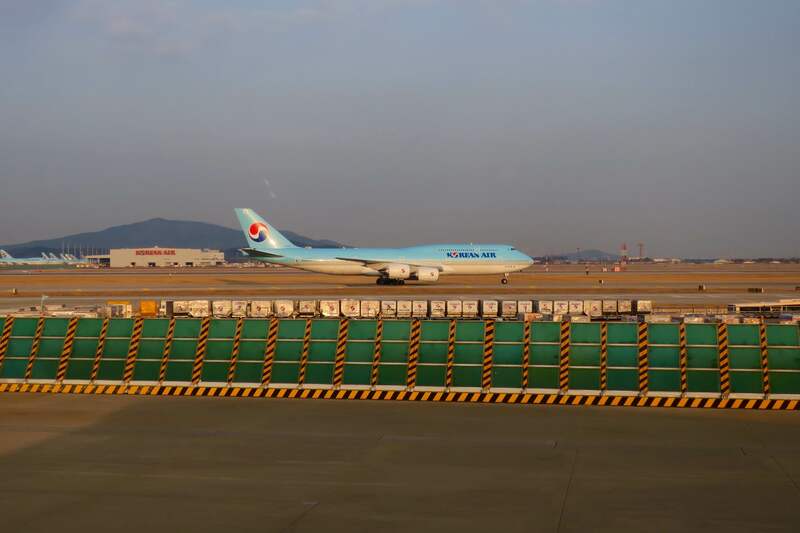 In Seoul, you can take advantage of the very useful City Airport Terminal located in the Gangnam District, in which you can save time by pre-passing through immigration and board the 90-minute bus to the airport. At both airports, the First and Business boarding lines are together, which can get quite crowded, especially for the A380. 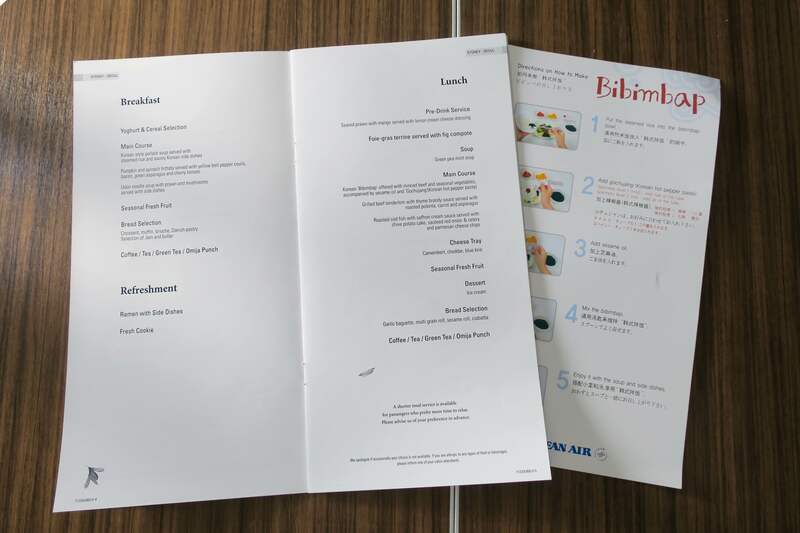 I found the food to be hit-and-miss on both flights, however, it must be noted that the timing between courses was perfect. There was always an ample amount of meticulously prepared food and the food temperature was correct, but about a third of the dishes were not too my taste. Unlike the food service, drinks took an unusually long time to be prepared. 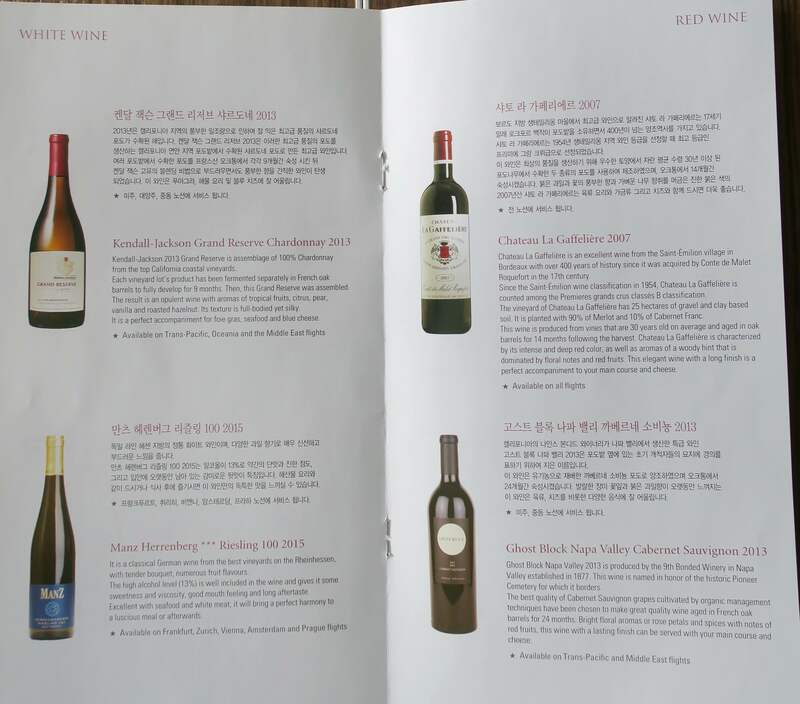 The wines served were of a quite good standard, however, navigating the wine menu was difficult as each wine is available only on certain routes. Perhaps they could make a customised wine menu for each region. The first thing to do is sign up for a free SkyPass account, as you must have an account to search for award availability. 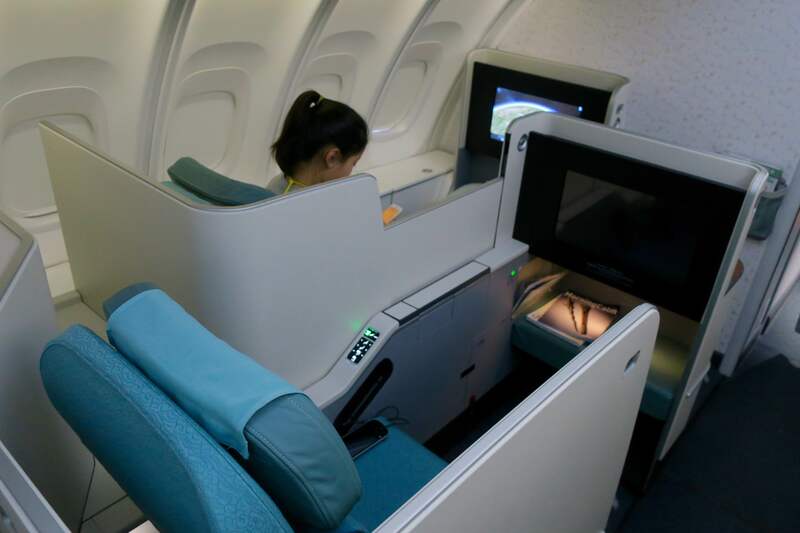 The good news is that Korean Air has amongst the best First Class availability of any frequent flyer program in the world and its website is relatively easy to use. 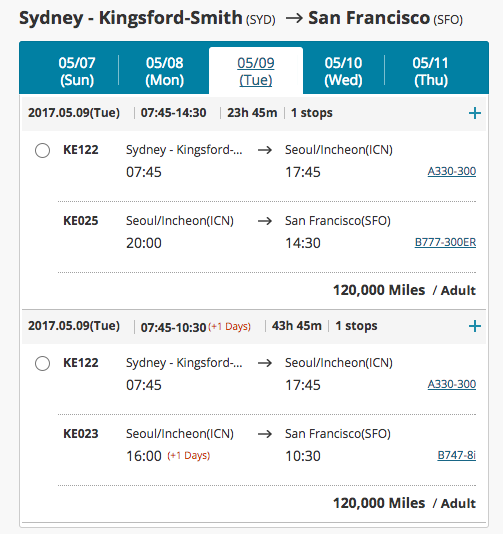 This First Class flight from Sydney to San Francisco with a free three-day stopover in Seoul cost me 120,000 miles one-way redeemed through Korean’s own SkyPass frequent flyer program. 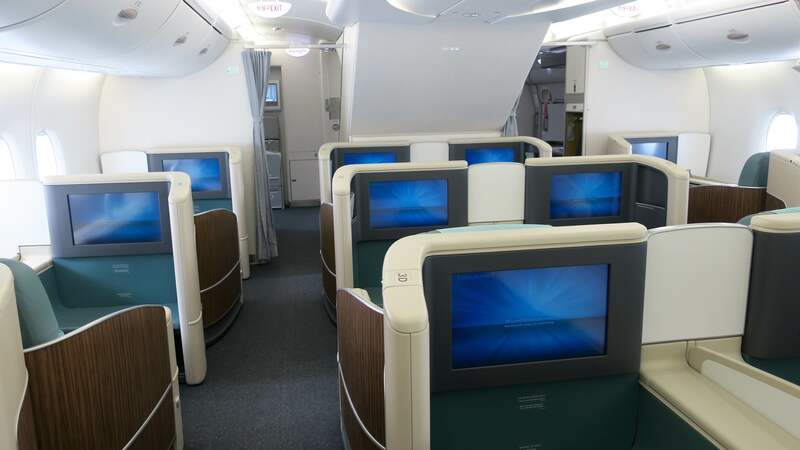 The same journey in Business (or ‘Prestige Class’ as Korean Air calls it) would set you back 97,500 SkyPass miles. Note that SkyPass differentiates between peak and off-peak award pricing, with peak dates of around four one-week periods a year plus one month from mid-July to mid-August. The above prices are for off-peak dates. More details can be found on the SkyPass website. The taxes on this flight were $126 USD. SkyPass has a very generous change and refund policy. 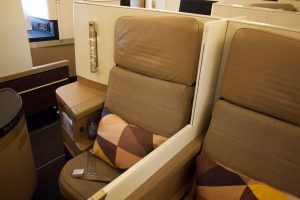 I originally had a booking for Prestige Class but upgraded to First Class for no change fee as I realised it was only 22,500 more for both segments. The program is changing slightly, but not much. From 1 August 2017, date and route changes will cost 30,000 Korean won (~$35 AUD) and refunding an award ticket 3,000-10,000 miles. In Australia/New Zealand, there is only one way to transfer points to SkyPass, and that is transferring points from Starwood Preferred Guest program, which convert to SkyPass at a 1:1 ratio. A 5,000 point transfer bonus is also available when you transfer points from Starwood in 20,000 point chunks. 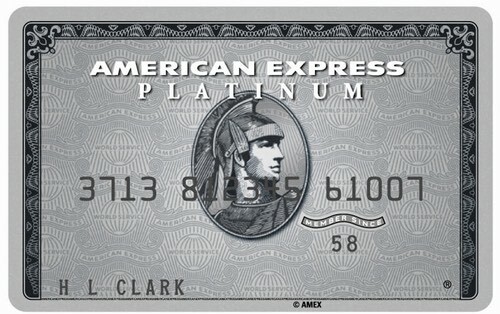 You can earn Starwood Preferred Guest miles only from American Express Membership Rewards cards like the Platinum Edge or Platinum Charge. 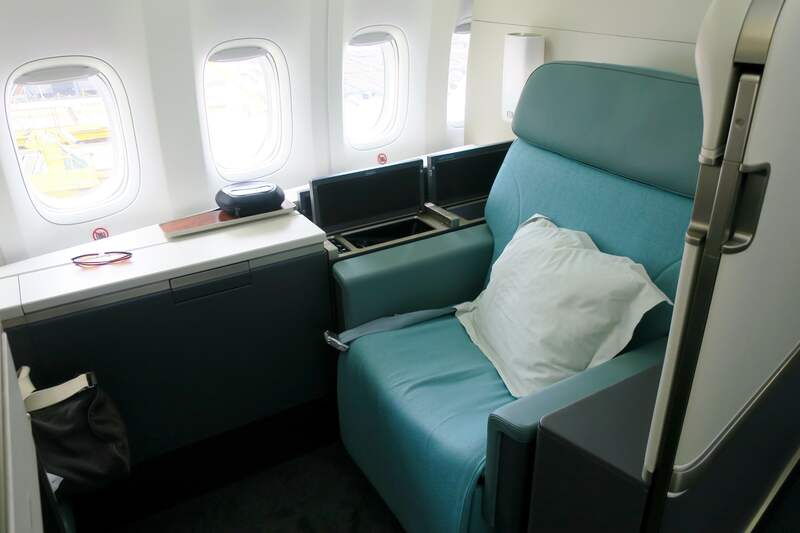 First Class redemptions on Korean Air are not permitted through Mileage Plan, but roundtrip Business Class awards are. A roundtrip Business Class ticket between Australia/New Zealand and the Continental US costs 125,000 miles. 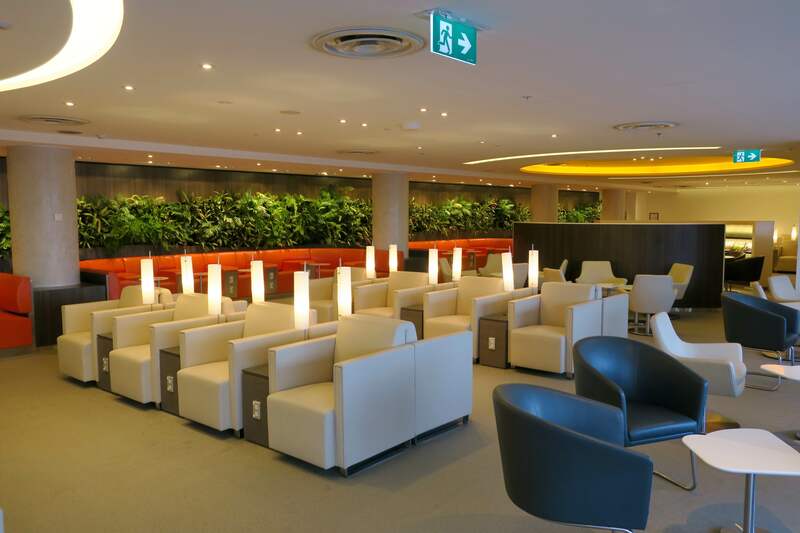 First and Business Class passengers in Sydney get access to the solid SkyTeam Lounge. You would expect that a full-service Asian carrier would have a stellar First Class lounge at Incheon, one of the best airports in the world. 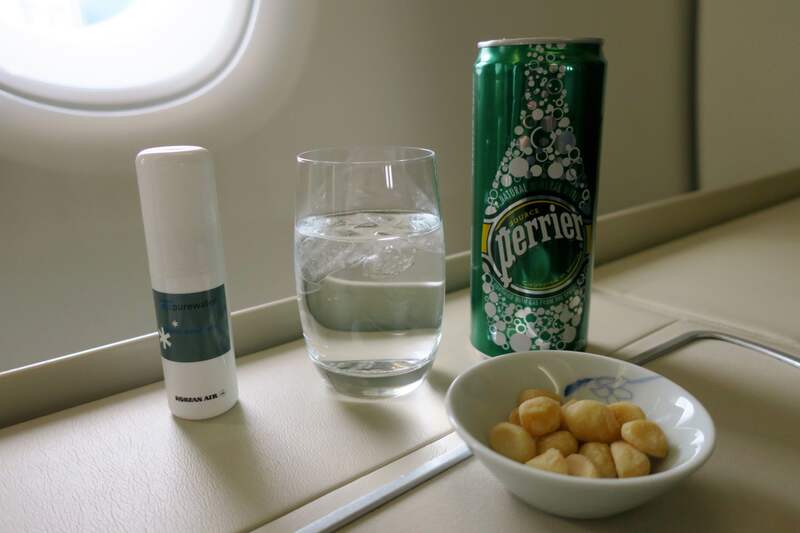 Oh no, do not be mistaken – the Korean Air First Class Lounge is a huge let-down, so much so that I didn’t even warrant it worthy of a photo during my visit. Your time is much better spent at the Asiana Business Class Lounge, which provides free access as part of the Priority Pass lounge network. Just be aware of some English language and customer service limitations, as well as the terrible lounge in Seoul. 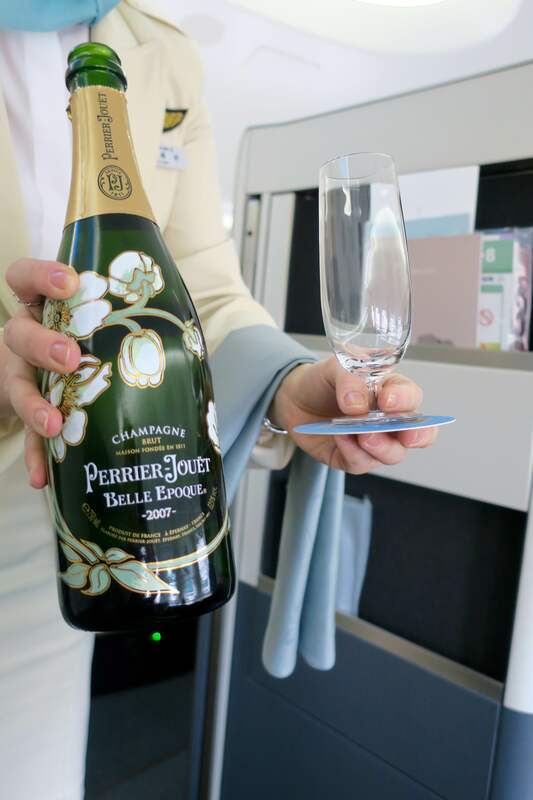 Earning Starpoints through Starwood Preferred Guest and transferring them to SkyPass represents the best value for redeeming an award on Korean Air First Class.